The SFV650 helps define a unique motorcycling experience. With a compact open trellis frame, aggressive styling, and a 645 cc V-twin, double overhead camshaft powerplant, the SFV650 appeals from the outside in. It's light, crisp feel and smooth low- to mid-range power delivery from the SFV650 just screams for a tour of your favorite road. European inspired styling treatment features sleek flowing lines and an unmatched elegant look. The carefully shaped seat has ample padding and the rear edges are bolstered to support the rider's hips well. 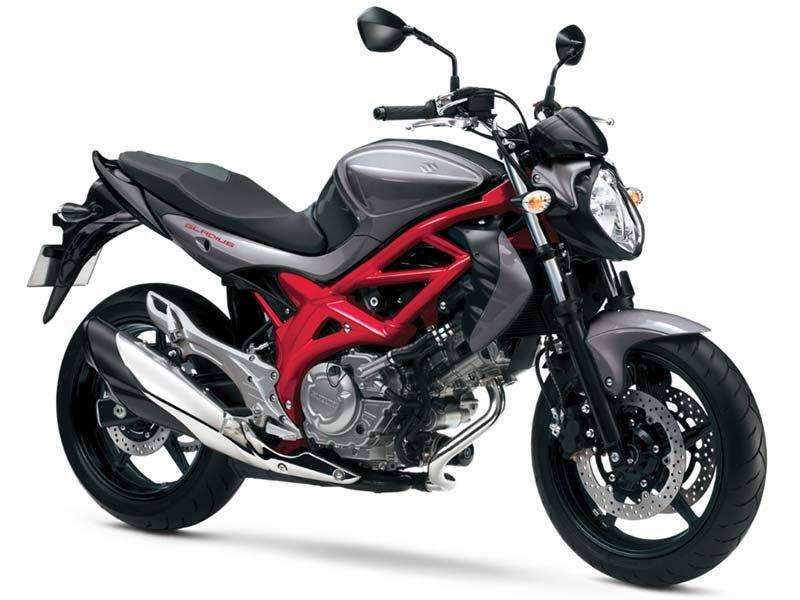 Tubular handlebar shape and footpeg positions are designed to work with the seat position to add to rider comfort. Stylish 17 inch cast aluminum - alloy wheels feature a new five spoke design with a 17 x 3.50 inch front wheel and a 17 x 5.00 inch rear wheel. Dunlop qualifiers sport radials are fitted with a 120/70ZR17 front and a 160/60ZR17 rear tire. Compact combination tail and brake light is packaged neatly underneath the rear seat framed by stylish seat rails and also flanked by clear lens turn indicators. Organically shaped multi reflector headlight incorporates high and low beams as well as a position light and flanked by chrome lens turn indicators. Fuel pump is lighter and more compact and located within the 15 liter fuel tank. Instrument cluster is positioned above the headlight and provides an analog tachometer, LCD digital speedometer, LCD dual trip-meters and odometer. An LCD digital clock, and LCD digital gear position indicator are also featured. Indicator lights include a two way remaining fuel warning lamp, backed up by an LCD digital reserve trip meter. Front forks feature 41 mm stanchions with spring preload adjustability over a 15 mm range and front wheel travel is 4.9 inch. Single rear shock is connected to the rectangular-section steel swingarm through a progressive linkage which allows the suspension to react smoothly to bumps and improve overall ride comfort. Rear shock spring is preload adjustable over a seven step range and rear wheel travel is 130 mm. Dual floating front brake discs measure 290 mm in diameter and work with dual piston calipers; single 240 mm rear disc brake disc works with a single piston caliper. Chassis and bodywork are designed to be as slim as possible where the fuel tank meets the seat, the outside forward edges of the seat are rounded and features a low 785 mm (30.9 inch) seat height. All to make the new SFV650 easier for entry level riders to comfortably put both feet on the ground when stopping and for maximum rider confidence. Compact trellis steel frame featuring 25 degree of rake and 104 mm of trail for stable and sporty handling with a beautiful look. Each cylinder head features a compact combustion chamber with two 31 mm intake valves set at 14 degrees from the cylinder centerline and two 25.5 mm exhaust valves set at 16 degrees from the cylinder centerline. Each 39 mm, extra-fine, ten-hole atomization injectors produce an average spray particle diameter that is improves combustion efficiency. Suzuki Dual Throttle Valve (SDTV) fuel injection system provides better efficiency and throttle response through a butterfly valve system with the primary valve controlled by the rider and the secondary throttle valve controlled by the engine management system. An automatic Idle Speed Control (ISC) system is integrated into each throttle body, and produces stable idle while improving cold starting and reducing emissions immediately after start up. Dual spark plugs cylinder heads feature iridium spark plugs to reduce spark plug electrode degradation and allow the electrode to be finer producing a more intense, hotter spark and further enhancing combustion. Single valve springs reduce inertia weight and mechanical losses while maintaining accurate valve control. 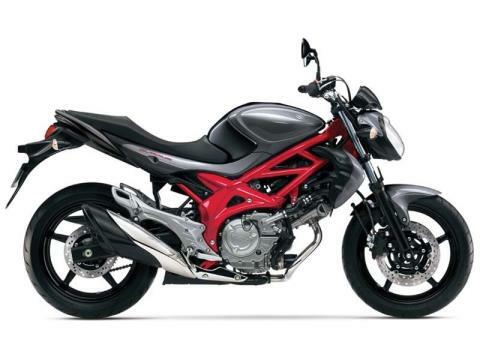 The SFV650 is powered by a 645 cc sporty fuel injected, DOHC, 90 degree V-twin engine based on the proven SV650 powerplant famous for its long term reliability, broad power and quiet rumble. An oval throttle pulley helps smooth low rpm/mid-range power delivery. Race-proven Suzuki Composite Electrochemical Materials (SCEM) cylinder plating reduces friction and improves heat transfer, durability and ring seal. The SFV650 arrives with a lighter and narrower radiator to increase efficiency, while an enhanced liquid to liquid oil cooler reduces weight. To reduce mechanical noise, a scissor type primary gear is split length wise with the two halves spring loaded, and the clutch and countershaft sprocket covers are now double layered for additional sound reduction. Clutch release mechanism is changed from ball-screw type to cam type system and the transmission gear engagement dogs are strengthened to help improve shifting of the six speed transmission. A strong and smooth shifting six-speed transmission.